This recipe was Drink of the Week on 2006-02-06. Check out the review! 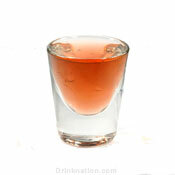 Add apple pucker and Crown Royal to a shot glass, then add a splash of cranberry juice on top. This drink recipe was submitted by one of our good-looking readers, dcfluffer! Can't go wrong with this mix. So good and yet so strong. So hung over from doubles of these.. so good.